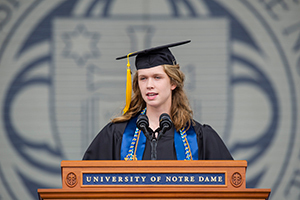 On Sunday (May 17) in the Notre Dame Stadium, the elation of the University of Notre Dame Class of 2015 was pierced by tragedy as classmates remembered William Meckling, of Centennial, Colorado, who died Saturday (May 16) in an accident on campus. Notre Dame provost Thomas G. Burish began the ceremony by inviting the graduates and their families to observe a moment of silent prayer for Meckling and two other Notre Dame students who died earlier this academic year, senior Lisa Yang of the Mendoza College of Business and Akash Sharma, College of Engineering. Throughout the 170th Commencement Ceremony, the speakers invoked the memory of Notre Dame’s late president emeritus, Rev. Theodore M. Hesburgh, C.S.C. Grammy Award-winning singer and musician Aaron Neville received the 2015 Laetare Medal, the oldest and most prestigious honor given to American Catholics. Recalling his childhood days at St. Monica’s grade school in New Orleans, Neville said, “I was always mesmerized by the Blessed Mother, and was grateful to get the chance to learn the Ave Maria.” In his distinctive and sonorous falsetto, Neville then sang Franz Schubert’s Latin hymn and received a standing ovation. In addition to the honors given to Neville and Patten, honorary degrees were given by the University to Freeman A. Hrabowski III, president of the University of Maryland, Baltimore County; John E. Kelly III, senior vice president, solutions portfolio and research for IBM; Jane McAuliffe, a scholar of the Quran and early Islamic history, and director of the John W. Kluge Center at the Library of Congress; Alfredo Quiñones-Hinojosa, professor of neurosurgery and oncology at Johns Hopkins Hospital and director of its brain tumor surgery program; Shirley Welsh Ryan, Notre Dame Trustee emerita and co-founder of Pathways.org; and Rev. Thomas F. Stransky, C.S.P., rector emeritus of the Tantur Ecumenical Institute. Originally published by Michael O. Garvey at news.nd.edu on May 17, 2015.